President Trump’s ambassador to the United Nations, Nikki R. Haley, said on Tuesday that she would resign at the end of the year, marking the departure of one of the few high-profile women in the Trump administration. Ms. Haley, a former Republican governor of South Carolina, had been an early and frequent critic of Mr. Trump, but he named her to the United Nations job weeks after his election. As ambassador, Ms. Haley has been an outspoken and often forceful envoy — someone whom foreign diplomats looked to for guidance from an administration known for haphazard and inconsistent policy positions — who emerged as something of a star amid the dysfunction of the president’s first national security team. White House staff members were caught off guard by the announcement, which Ms. Haley and Mr. Trump had kept closely under wraps. But the president said Ms. Haley had informed him roughly six months ago that she wanted to take a break by the time his administration reached its second anniversary. He said that he hoped Ms. Haley would return in a different role, and that he would name her successor in the coming weeks. Ms. Haley is said to have a strained relationship with Mr. Bolton, a longtime critic of the United Nations and a more dominant figure than his predecessor, Lt. Gen. H. R. McMaster. But she has been closely allied with Ms. Trump and her husband, Jared Kushner. The couple held a dinner in New York months ago celebrating Ms. Haley’s tenure there, and during her appearance with Mr. Trump on Tuesday, she singled them both out for praise. People close to Ms. Haley insisted there was nothing behind her decision other than fatigue after nearly two years in a rigorous job. She also wanted to make her decision known before the midterms to avoid the potential for an embarrassing departure if the vote were to go against the president. Ms. Haley’s joint appearance with Mr. Trump and his effusive praise for her made her a rarity among officials departing the Trump administration, whom he often criticizes as they go out the door. But the timing irked some West Wing aides, who saw the announcement as taking attention away from the swearing-in of Justice Brett M. Kavanaugh and his first day at the Supreme Court. Soon after her arrival in New York, Ms. Haley, the first cabinet-level United Nations ambassador for a Republican administration since the end of the Cold War, quickly made clear that she saw the position as a steppingstone to a higher political office — a possibility that Mr. Trump may have resented. But Mike Pompeo, Mr. Tillerson’s replacement, has recently reasserted the secretary of state’s traditional role, and with Mr. Bolton a sometime antagonist, she had less of a role than at the start of the administration. Ms. Haley, who has long been seen as a potential presidential candidate, said on Tuesday that she had no intention of running in 2020, as has been speculated. Instead, she said, she plans to campaign for Mr. Trump’s re-election. In the short term, people familiar with her thinking said that she is likely to work in the private sector and make some money. After nearly eight years in government — six years as governor of South Carolina in addition to her time at the United Nations — her 2018 financial disclosure report shows Ms. Haley has at least $1.5 million in debts, including a mortgage of more than $1 million. For the moment, few Republican strategists believe that Ms. Haley is inclined to run against Mr. Trump. But those who know her believe that she is likely to run in 2024, or even in 2020 should the president not run again. “An open presidential race is a better chance to show off her incredible political skills, rather than some quixotic primary effort,” said Matt Moore, who was the Republican Party chairman in South Carolina when Ms. Haley was governor there. The daughter of immigrants from India, Ms. Haley favored free markets and global trade and earned international attention when she was South Carolina’s governor for speaking out against the display of the Confederate battle flag in front of the State House in the aftermath of the 2015 massacre at a black church in Charleston. During Mr. Trump’s presidential campaign, she sharply criticized his demeanor and warned what it might mean for American diplomacy — even suggesting that his tendency to lash out at critics could cause a world war. Those disagreements continued after she joined his administration. Ms. Haley acknowledged her policy disagreements with the president in an op-ed in The Washington Post last month when she criticized an anonymous senior administration official who wrote an opinion piece in The New York Times describing a chaotic administration in which many of the president’s aides disagreed with their boss. Last December, Ms. Haley said that women who had accused Mr. Trump of sexual misconduct “should be heard, and they should be dealt with.” It was a surprising break from the administration’s longstanding assertion that the accusations were false, and that voters rightly dismissed them when they elected Mr. Trump. “I think any woman who has felt violated or felt mistreated in any way, they have every right to speak up,” Ms. Haley told CBS. In April, Ms. Haley announced that the administration would impose sanctions on Russian companies found to be assisting Syria’s chemical weapons program. It was part of a menu of options on how to retaliate against a suspected gas attack that killed dozens on April 7. But the next day, the White House announced that Mr. Trump had decided not to go forward with the sanctions, contradicting Ms. Haley. At the State Department, however, officials quietly applauded Ms. Haley’s strong words on Russia. With Mr. Trump refusing to criticize President Vladimir V. Putin and some of his advisers reluctant to get too far in front of him, they felt she was stepping into a vacuum. Last month, Ms. Haley collided with Mr. Bolton after she announced that Mr. Trump would lead a session of the United Nations Security Council devoted entirely to Iran. After European officials protested that doing so would showcase divisions in the West because of Mr. Trump’s decision to pull out of the Iran nuclear deal, the White House broadened the theme to countering weapons of mass destruction. Mr. Bolton did not criticize Ms. Haley. But he drove the decision to shift the agenda. White House officials noted that under United Nations rules, Iran would have been entitled to send its president to the meeting — setting up the awkward possibility that Mr. Trump would have sat across a table from Iran’s leader. Ms. Haley also favored negotiating the continued participation of the United States in the Global Compact for Migration, a senior administration official said. But officials at the White House opposed it, and the United States announced last December it was pulling out. 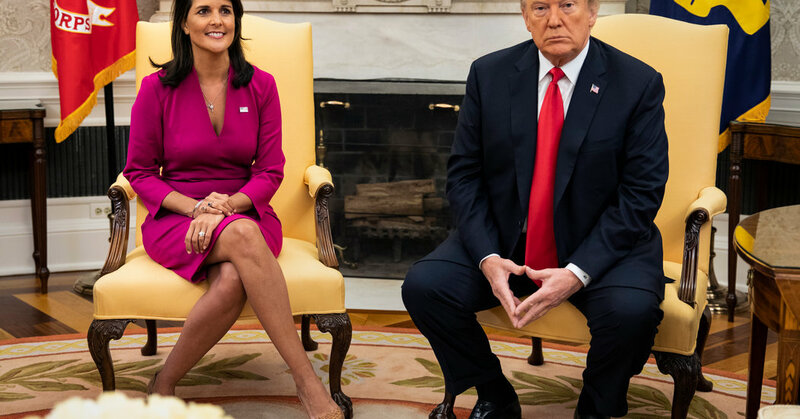 At times, though, Ms. Haley seemed more in sync with Mr. Trump on policy than other members of his national security team, and she did not hesitate to highlight that. She spoke out forcefully in favor of the president’s formal recognition of Jerusalem as the capital of Israel, as well as his decision to cut American funding to Palestinian refugees. Ms. Haley has been criticized by Citizens for Responsibility and Ethics in Washington, a liberal nonprofit watchdog group. On Monday, the group sent a letter to Steve A. Linick, the State Department’s inspector general, asking for an investigation into whether Ms. Haley had violated executive branch regulations on accepting gifts. The letter said Ms. Haley and her husband accepted seven free flights on luxury private aircraft from three South Carolina businessmen in 2017, at an estimated worth of tens of thousands of dollars. Representatives for Ms. Haley did not reply to a request for comment. Reporting was contributed by Julie Hirschfeld Davis, Jonathan Martin, Eileen Sullivan and Michael Schwirtz. When U.N. Envoy Nikki Haley Talks, Does President Trump Listen?